I don’t usually like to buy stuff for myself this close to Christmas, but when Lewis Wayne Gallery announced a series of auctions with starting bids of a penny each, I had to take a look, and among the various offerings of art and photographs, I found two items I thought I’d like to own, if the price was right. And much to my surprise, earlier today, I won them both, and now I’m here to share them with you. 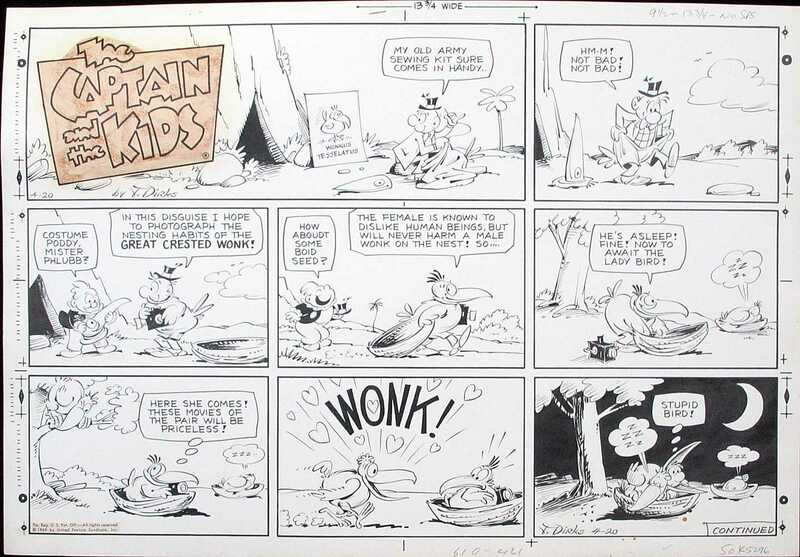 Currently, the cheapest “Captain and the Kids” strips available from Lewis Wayne Gallery outside of the recently concluded penny-start auctions can be had for the “Buy It Now!” price US$89.95 plus shipping; meanwhile, the most expensive are US$295.00 plus shipping. So, I definitely feel like we got a deal. I love Bob Montana’s artwork here; I love the contrast between Jughead’s old-fashioned suit and tie and slicked-down hair and the trendy ’60s clothing and hairstyles of the other characters (although Archie is stuck with his usual do); and I love the gag! The final auction price for the strip was a mere US$58.57 plus shipping. And I love that, too! Because out of the pair of strips I had decided to bid on, the “Archie” strip was the one I wanted the most to win, and if the price had soared too high — my final bid was significantly higher than what I actually ended up paying — I would’ve had to allow the “Captain and the Kids” strip to slip through my fingers. How fortunate for me, then, that the auction for the “Archie” strip ended first!